Gardens all over are harvesting cucumbers and radishes, and fresh dill is plentiful! If you are hosting a late summer barbecue or going to a potluck, this is an easy and super delicious vegan salad recipe everyone will adore. Be creative and change up the ingredients! We find that many new vegans and new vegetarians often ask “what can I eat?” Converting an old favorite recipe into a new, healthy version doesn’t have to be complicated. Switch up a few ingredients and enjoy the amazing flavors of plant-based meals. We know you’ll love it. An easy and delicious vegan salad that takes minutes to prepare. Great for potluck events, a healthy lunch, or as a side dish to any barbecue. Mix everything except the cucumber, radish and onion together. Give it a taste and adjust flavorings. Some people prefer more or less dill. We love dill, so the more the better! Add cucumber, radish and onion and stir to combine well. Note: Cucumbers will release water, so you may find your salad dressing thins out a little. Don’t worry! It is just as delicious! 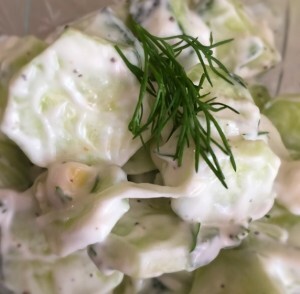 We of course use VEGAN sour cream or non-soy Veganaise for this recipe as an extra thick and delicious dressing.